You'll Die Laughing... Again & Again! My favorite card subject is one of Topps most successful non-sports card genres: Monster cards. Almost every major non-sports card company has dabbled in these, but it all started in 1959 when Topps introduced Funny Monsters. Collectors usually call the series (and its two sequels) You'll Die Laughing, because that's what the large title on the back states. All three series also have the same art below the title. A Martian, vampire, mummy, Frankenstein monster, ghoul and werewolf stand behind an extra wide gravestone with a silly joke printed in red on it. Kids were supposed to die laughing after reading it, but based on my muted reaction and the number of law suits Topps never paid for killing children, it's safe to say these jokes weren't that funny. No, the reason kids bought these cards was for what adorned the fronts-- neat-o monsters! Funny Monsters featured 66 very colorful drawings depicting a wide assortment of monsters with various gag lines beneath them. A kid might open the door to Frankenstein and say, "Ma, did you call for a baby sitter?" Or an ugly monster would ask a store clerk for a monster mask. The gags were about as lame as the ones on the back, but the artwork was captivating. The artist for most (if not all) of the series was Jack Davis, the same artist who drew a lot of monsters for EC comics and the Tales of the Crypt comics. This assignment must have been a walk down memory lane for him. Any fan of American pop culture knows that the 1960s was a hot time for monsters. There were Aurora monster models, Famous Monster magazines, countless Halloween masks, dozens of monster card sets, and almost all of this phenomenon was fed by new monster movies at the cinema and old monster reruns on TV. It was a golden age for monster fans and collectors alike! Those who kept their original Funny Monsters in near mint shape should be glad they did. Such sets are commonly $150 or so. (The fact that they are not more expensive is evidence of how many were collected. The series is said to have often sold out in stores across the country.) In 1966, they reissued some of the same artwork in double panel form for the Topps Pak O' Fun test series. 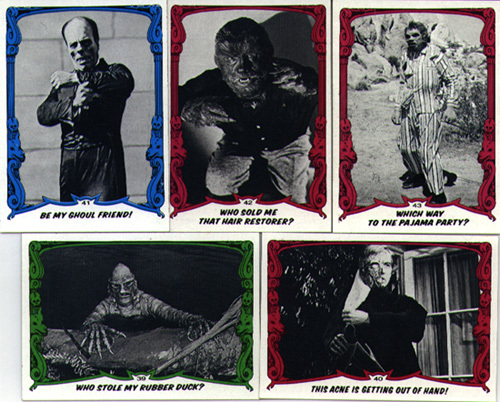 That series never took off, but their were plenty of other Topps monster efforts that did, including Frankenstein Stickers, Insult Postcards, Monster Greeting Cards, Monster Laffs, Monster Midgees, Monstickers, Monster Tatoos (with art also by Davis), Make You Own Name Stickers, Outer Limits, Terror Tales, Ugly Stickers, and the infamous Mars Attacks. In 1973, Topps reused the back art but went with a different concept for the front. They used black and white monster photos from the various Universal monster movies. This series was called Creature Feature on the wrappers, but again, collectors kept called it You'll Die Laughing because of the title on the backs. This time, the series was issued in two parts, 1-64, and 65-128. The first series is a little more common, but not much. They usually cost $50 to $75 per set in near mint condition. Another interesting subtlety of this series are the 18 test cards discussed by Ron Wilson in Wrapper issue #119. Only the real hard-core collectors bother with those though, since they are identical to the regular cards accept the numbering sequence is different. I loved the '73 series as a kid, and tried to collect them all despite my mother's determination to toss them out whenever she found them. I finally ordered one of those cheap plastic book safes from the back of a comic book and hid them in there. They managed to survive the purge tucked away inside, but I suspect my mother wasn't really fooled. After all, what was a ten-year-old kid doing with a thick edition of The Principals of Economics on his book shelf wedged between dog-eared copies of Mad and Ranger Rick magazine? The final chapter of Creature Feature/ You'll Die Laughing trilogy appeared in 1980. It had some minor makeovers, including yellow, red and green added to the backs. The fronts also added a gaudy picture frame graphic in similar colors surrounding the black and white photos. When I first saw the 1980 series, I thought it was nothing more than a reissue of the 1973 set with different borders. I sold mine until I realized about 30% of the 88 photos in the set had been replaced with new images, and even a few of the jokes were updated. It's still an uninspired cost-cutting reissue, but worth getting for the $30 to $50 it costs today. One of the nicest additions to 1980 set were the 22 stickers. 13 had psychedelic colored monster faces on them, and the other nine had gorgeous full color monster posters. The backs formed a color poster of the Creature from the Black Lagoon. The other interesting change is that the backs tell what movies the front photos are from. So there you have it; three versions of the same monster series spanning three separate decades. Will it ever be resurrected in the new century as well? My guess is that if Topps sees a profit in it, the You'll Die Laughing monsters will come running (not crawling) for our hard earned money. And I for one will hand it to them.